(I start grilling the pork chops at the same time I start cooking the casserole. The chops really shouldn’t need more than 5-6 minutes on a super hot grill, which means that they have time to rest as I finish making the bean stew. If you can handle cooking both at the same time, you’ll definitely be able to make this dish in under 20 minutes). 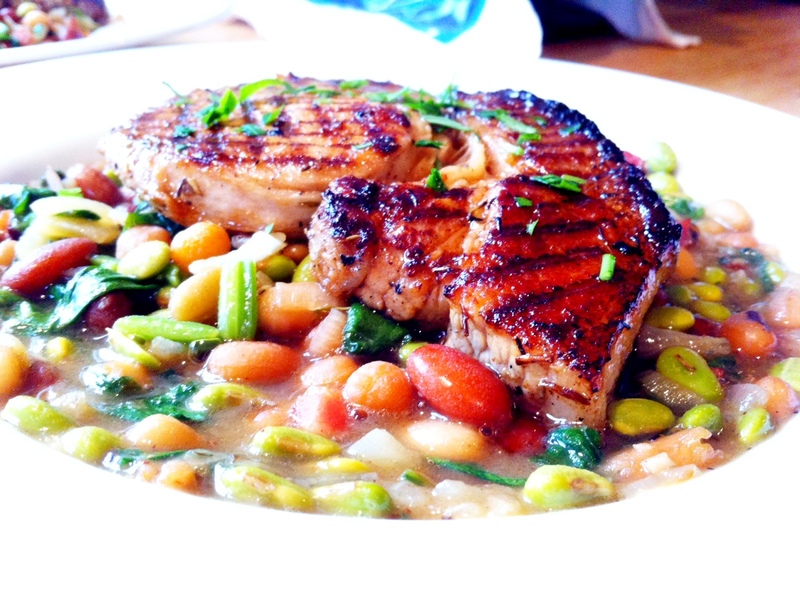 Grilled pork chops (in lemon and thyme) and beans (in cider). Place your pork chops and all of marinade ingredients into either a plastic zip-lock bag or bowl and mix well. Seal your bag/bowl and marinate in the fridge for at least 2 hours. An hour before you intend to eat, remove your pork chops and allow them to come back up to room temperature (about an hour). Melt the butter in olive oil in a sauce pan. Fry your pancetta until they start going crispy and the oil has been released from the pancetta. Add the onion, shallots and garlic, turn down the heat and sauté on medium heat for 5 minutes. Turn the heat back to high, and then add the cider, stirring the bacon and onions constantly and allowing the onions to absorb all of the cider (like adding stock to a risotto). When the cider has been absorbed, add your beans and edamame, toss well and then add your chicken stock and thyme. Once it starts to boil, add a squeeze of lemon juice, reduce the heat and simmer for 5-6 minutes. Season to taste with salt and pepper. Add your fresh spinach, cook for another 1-2 minutes and add some roughly chopped parsley. Ladle into a bowl and eat as is or with the grilled lamp chops.